Saw this torn poster around the Wanhua district while out to lunch. It’s a path marker left by a parade to welcome the Gods of Loyalty (尪公) into the Palace of Heaven. The gods of loyalty were two Tang dynasty generals Zhang Xun (張巡) and Xu Yuan (許遠) who were honored by Emperor Suzong (唐肅宗) posthumously for their loyalty in dying defending the Tang dynasty during the Battle of Suiyang against Yan troops. Interestingly, this was quite controversial as they are said to have encouraged cannibalism during the battle. 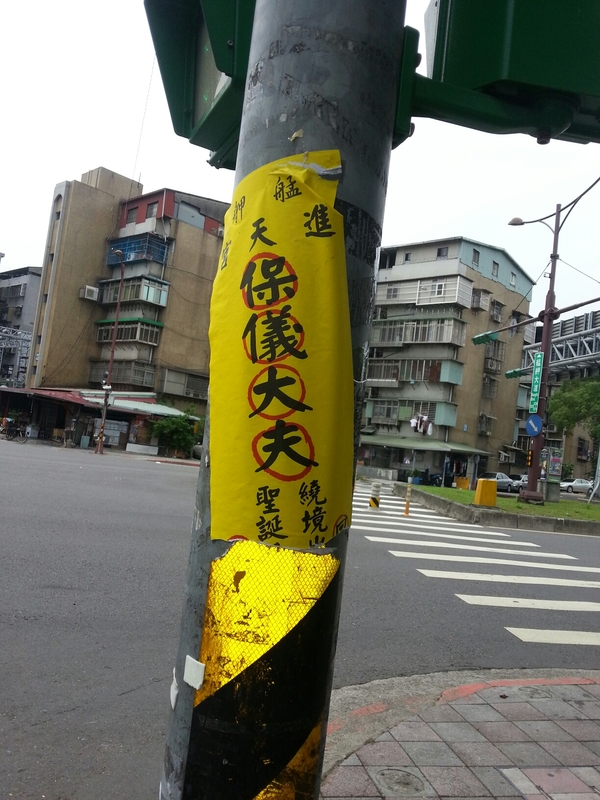 「尪公」 or Gods of Loyalty is a common way to refer to the 「保義大夫」 or “senior officials upholding justice,” which you can see written at the center of the torn poster. The tweflth day [of the fifth lunar month] is the ceremony of the senior officials upholding justice. Wang Gong is the colloquial name for the “senior officials upholding justice.” Apparently the “senior officials upholding justice” can help to get rid of pests in farmland and people believe that wherever the palanquin of the gods passes will lead to the death and destruction of pests and insects in neighboring land, so the palanquin has to pass through the paths around fields. The palanquin of the senior officials upholding justice is quite small and is carried by only two people. On the day of the ceremony, offerings are made by local residents, offering a variety of sweet, sour, bitter, spicy and salty dishes to reward the celestial troops and give strength to those taking part in the parade. This entry was posted in Curiosities, Home and tagged china, Chinese, cross-culture, 萬華, folk religion, Taiwanese, Tang Dynasty, wanhua, 尪公 by ladenframe. Bookmark the permalink.